Using archival photographs and candid insights like Roche’s, the film takes on the prolific, multidisciplinary career of Charles and Ray Eames. With only occasional lapses into cheesiness—computer-animated cherry blossom petals flutter across the screen as the couple’s romance is described—it remakes the old argument that Charles (masculine, forceful, craftsman-thinker) and Ray (reticent, artistic, magpie-like hoarder) were some sort of yin and yang that produced the magic of the Eames office. There is a lot of discussion in the film about their incessant image-making: “Perhaps their greatest creation,” the celebrity narrator, James Franco, intones, “was the image of Charles and Ray Eames.” But, I said to myself, what of their writing? Roche’s comment was the one thing that really stayed with me out of the 84-minute documentary, because my first encounter with the Eameses was through their words. I’m too young to have heard Charles Eames speak. But he and Ray spoke to me, nonetheless, and to thousands of designers in India over the last five decades, through a slim document they wrote in 1958, called The India Report. The Eameses undertook a three-month research trip in a modernizing socialist nation to “recommend a program of training in the area of design which would serve as an aid to the small industries.” That first line of the report seems to bode some dreadful reading ahead, and suggests a dinky shop floor with failed engineers trying to bring some pizzazz to washing machines. There is plenty of that kind of nuts-and-bolts stuff in the report—Who should be on the board of governors of a design school? What should the qualifications of the first students be?—but occasionally the writing lifts itself up into greatness. In three months, the Eameses struck to the root of India’s peculiar relationship with the modern world. “The change India is undergoing is a change in kind not a change of degree. The medium that is producing this change is communication; not some influence of the West on the East,” they declare, with the tone of absolute authority that always seems to ring in a great truth. The documentary shows how Charles and Ray Eames were part of the dawning information age, especially through their work with IBM (“They worked for the Google of their time,” Richard Saul Wurman says). 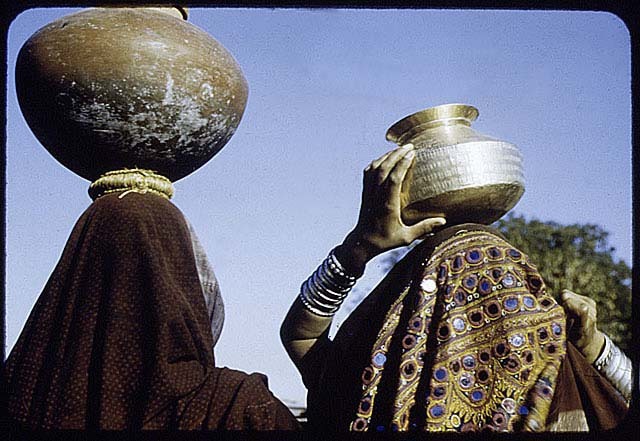 Women carrying lotas, photographed by the Eameses in 1958. Image courtesy the Library of Congress, sourced from here. An institute did come out of The India Report—India’s first design school (some say the first in the developing world) and my alma mater—marking the beginning of formal design education in the country. For all the jokes we made about the Lota, the vision of the report still resonated with young Indians in the early years of this millennium. Indeed, the search for good design for the common Indian people is still on—the Tata Nano was one high-profile attempt. Another interesting fact about this piece of writing is that it is credited to both Charles and Ray Eames. Eames: The Architect and the Painter was ostensibly about how the Eameses contributed equally to the work of the office, but the film constantly tries to prove what Ray’s contribution might have been—she suggested the colors, she wanted the forget-me-nots. It is a little too obsessed with assigning credit. In that light, what I like best about The India Report is that it is impossible to pick at, saying ‘That’s Charles’s idea’ or ‘This must be Ray’s influence.’ Ultimately, isn’t that what the best teamwork is about—the brilliant synergy that firmly resists being broken down into constituent parts? In the Eameses' writing, as nowhere else, their voices are one. Charles Eames on his last trip to India, in 1978, visiting the National Institute of Design, which he and Ray helped create. The Eameses maintained a close relationship with the school for twenty years, working on projects with the students. Ray returned to the school a year before her own death, in 1988. Selecting the image of Charles and Ray as their greatest achievement seems like the kind of self-aggrandizement that the Eameses would have abhorred. When they came to India, they didn’t just come to teach, they saw and learnt. They were part of a cultural vanguard that not only exported American ideas around the world, but also opened American design up to the world’s artistic traditions (think of the tchotchkes that littered the Eames House, and filled Alexander Girard’s conversation pit in the Miller House). The husband-and-wife duo were among the heralds of professional design practice for an entire nation. In the realm of objects, there are many contenders to the post of “Greatest Eames Design.” But in the realm of ideas, I’d nominate The India Report. The full text of The India Report can be found on Design Observer here. This post is about the language of the report. For a more detailed treatment of the Eamses's relationship with India, including the circumstances surrounding the writing of the report, this paper by the art historian Saloni Mathur is an excellent reference. The Eameses photographed India endlessly. Those images cannot all be reproduced here, but you can find some of them on this site maintained by the Library of Congress. 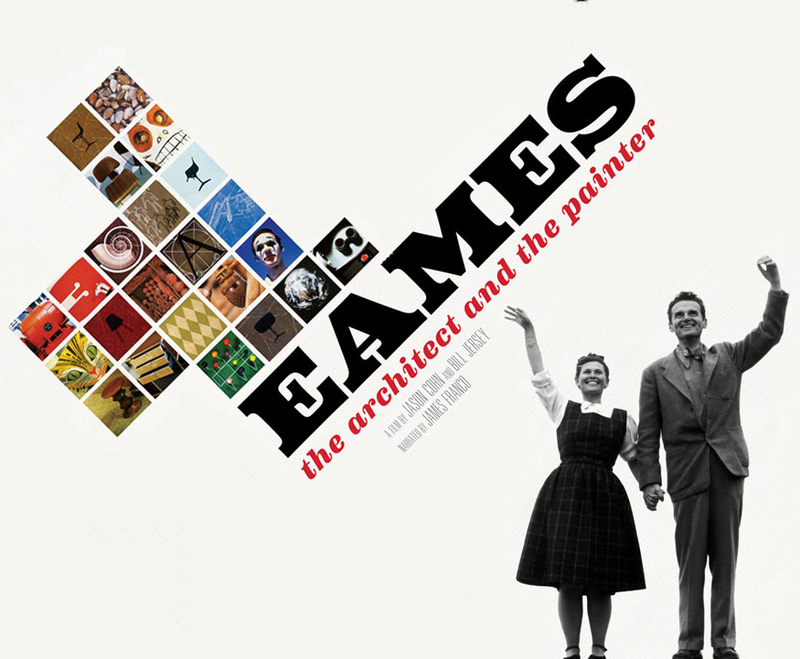 Eames: The Architect and the Painter will air December 19, on PBS, as part of the American Masters series.